Last month New Zealand Police announced a big win for the Christchurch community, arresting five suspects as part of an Organised Retail Crime (ORC) gang that had been operating in the area. This particular gang had been operating for years, and despite being well-known to retailers and their significant criminal reputation, retailers and police were unable to piece together their offending in a clear way that would support charges. It wasn’t until the intelligence from Auror starting connecting the dots around their offending that retailers and Police could understand the true nature of their offending. In all the police were able to make five arrests in connection with their shoplifting activity, but when Police conducted a search of a property after the arrests they discovered firearms ammunition and methamphetamine as well. This shows once again that retail crime is usually a gateway for offenders to become involved in more serious and damaging community harm. For Police, this was a big win that showcases the results that become possible by collaborating with the business community to join intelligence with data to get results. “Police has achieved this outcome, which will prevent further crime occurring across the Canterbury community, by working closely with retailers and Auror. We thank them for their assistance,” said Superintendent Lane Todd, Christchurch Metro Area Commander for NZ Police. 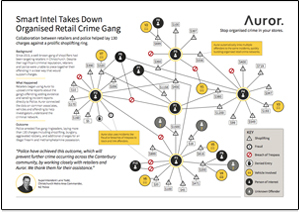 Check out the tangled web of offending and extent of the gang’s network in our new case study infographic.